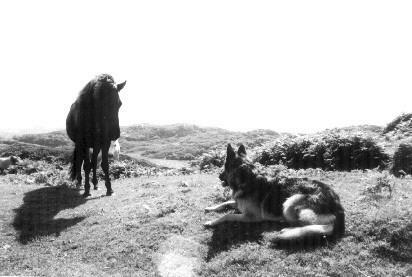 We managed to visit four WWOOF hosts in the summer of 2001 - a mere taster that has me wanting to pack my rucksack and set off again just writing about it! From the island idyll of Eigg via rugged and rocky Assynt and the misty beauty of the Beauly Firth we ended our travels in the heart of Scotland and the Affric mountains. All were working crofts at varying stages of self-sufficiency and our daily tasks included roofing, helping with sheep shearing, making felt and digging ditches. I'd like to say a huge thank you to Neil and Sue, Anna and Ray, Sheila and Les and Ian and Sasha for helping to make our summer of WWOOFing such an adventure. Wishing you all many more successful WWOOFing exchanges in the future. Some of these pages have a lot of piccies so please be patient.